Morcellator attorneys Rhett McSweeney and David Langevin are providing free legal consultations to individuals and families injured or harmed as a result of power morcellators currently the subject of a Class I FDA Recall. Give us a call or use our private contact form. On April 17, 2014, the Food & Drug Administration issued a Safety Communication warning patients about the serious dangers posed by the use of power morcellators in certain surgeries. The FDA has discouraged the use of these devices during hysterectomies and myomectomies, as the devices may create a risk of spreading unsuspected cancerous tissue throughout the patient’s body. 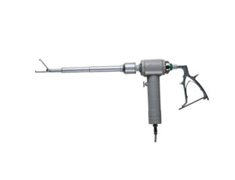 In response, Johnson & Johnosn, suspended sales of its laparoscopic power morcellator. Power morcellators are surgical devices used to cut uterine tissue during laparoscopic surgery. The device is designed to slice uterine fibroids into tiny pieces, allowing the surgeon to extract pieces through a small incision. It has been estimated that between 50,000 and 80,000 women undergo morcellator-aided hysterectomy procedures a year. Power morcellators are manufactured by Ethicon (a subsidiary of Johnson & Johnson), as well as a number of smaller companies such as Olympus, Karl Storz, and Blue Endo. Laparoscopic power morcellation is one of several available treatments for fibroids. It is a procedure involving a device that divides the uterine tissue into smaller pieces or fragments so it can be removed through a small incision in the abdomen. The FDA has determined 1 in 350 women who undergo hysterectomy or myomectomy for fibroids have an unsuspected type of uterine cancer called uterine sarcoma. If laparoscopic power morcellation is performed in these women, there is a risk the procedure will spread the cancerous tissue within the abdomen and pelvis, significantly increasing the patient’s likelihood of long-term survival. The FDA is now urging doctors to avoid using power morcellators during uterine fibroid treatments. The problem with morcellators is they may allow small pieces of tissue to be left behind after surgery. These pieces of tissue left behind may spread throughout the patient’s body. On occasion, the detached tissue (the tissue left behind) may contain cancerous cells. The power morcellators may actually cause cancerous tissue to spread and grow aggressively in the body, resulting in life-threatening health complications. The types of cancer spread by power morcellators may include leiomyosarcoma, myelosarcoma, and uterine sarcoma. Please feel free to contact one of our morcellator attorneys at 1-877-542-4646. If you prefer, feel free to use the form to the right, one of our morcellator attorneys will evaluate your claim and contact you shortly. Thank you.